Many people have fond memories of Easter Sunday dinners. 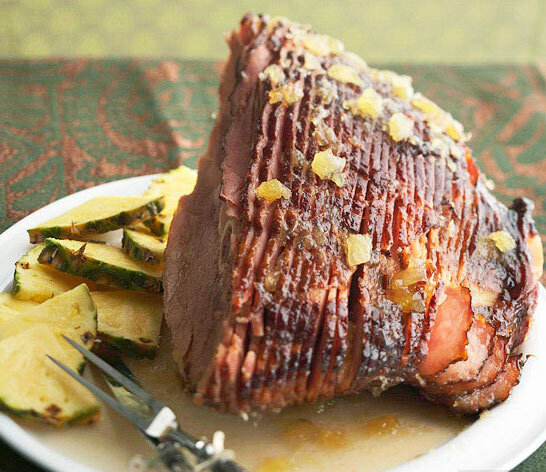 Baked ham usually was the centerpiece of these feasts. If your mom or grandma fixed ham like mine, the meat was scored and studded with cloves, rubbed with brown sugar and sometimes a little mustard and finally baked until the whole house smelled heavenly. Over the years, I’ve made our Easter ham a few different ways. Sometimes, I’ve used the scoring-cloves version with brown sugar sans the mustard. But more often than not, I’ve made a glaze with canned pineapple. Once, I tried a peach-glazed ham that was quite tasty. This year, I’m going the pineapple glaze route again, but this time using fresh fruit. And instead of studding the ham with cloves I’m going to make a homemade rub for it. It’s not your Momma’s or Grandma’s Easter ham, but I’m sure they’d approve. Combine all the rub ingredients in a small bowl and rub on all sides of the ham. Cover tightly with aluminum foil and bake for 1½ to 2 hours (depending on size of the ham. You can also follow the heating directions that came on your ham package). While the ham is cooking, make the glaze. Add the pineapple, water, brown sugar and cayenne pepper to a blender and blend until smooth. Transfer the liquid to a medium-sized sauce pan and heat over medium heat. Bring it to a boil then reduce the heat to medium-low and simmer for 15 minutes or until reduced by half and it thickens slightly. Reduce heat to low and keep warm until ready to glaze the ham. When the ham is done, remove it from the oven and increase the oven temp to 400 degrees. Use a pastry or silicon brush to brush about ½ the glaze all over the ham. Return the ham to the oven and bake for 15 minutes. After 15 minutes, brush with the remaining glaze and add any extra pineapple to the edge of the pan, if using. Bake the ham for a final 10 to 15 minutes until the glaze is caramelized and the pineapple is heated through.